New Balance SA recently introduced the new Liverpool kit from Warrior with a “red filled” evening that saw surprises such as an electrifying light display projected against the Cape Town Stadium and “party crashing” by Bruce Grobbelaar, who entertained the crowd with stories from his days as Liverpool goalie, as well as his experience with the Warrior brand. Gary van Rooyen (GM New Balance SA), Darren Tucker (MD New Balance Asia Pacific), Bruce Grobbelaar, Grattan Rippon (National Sales Manager New Balance SA). Photo by Brenton Geach. 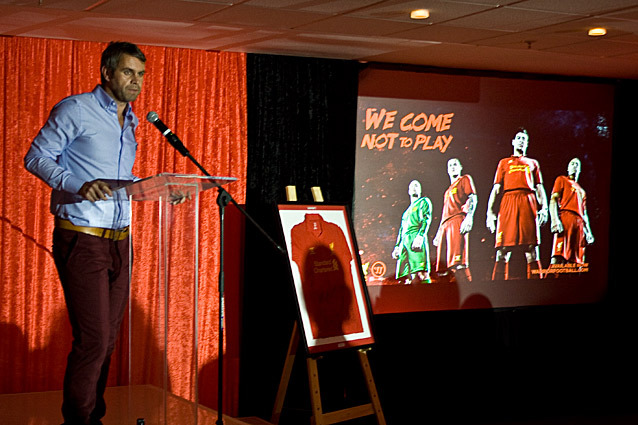 “If you want to be the best brand, you have to be part of the best sport,” announced Gary van Rooyen, GM of New Balance SA. New Balance international owns the Warrior brand. 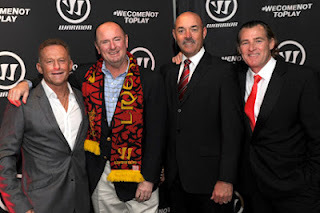 Warrior has a longstanding association with lacrosse and in June the brand expanded their sports association by entering the soccer arena. Their first club signing is Liverpool F.C. 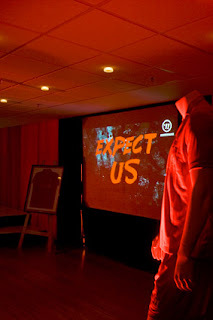 and, despite the team only playing for the first time in the new kit in July, they have already experienced record sales with fans embracing the new design. Warrior’s pay off line (we come not to play) could not be more appropriate – both on and off the playing area. The brand was, after all, started by a former lacrosse player who got so fed up with breaking too many sticks that he went home and designed his own, stronger, version. The brand has a hard image: work hard and party hard. It’s therefore fitting that their brand ambassador is none other than actor and former Welsh captain and bad boy Vincent "Vinnie" Jones, a man known for his tough man image on the pitch and on the big screen – he holds the record for the quickest ever booking in a soccer match, after only three seconds. But, the brand is also represented by current Liverpool and Wales national team player, Craig Bellamy, who started the Craig Bellamy Foundation for disadvantaged children in Freetown, Sierra Leone – where he is helping to build a non-profit soccer academy in the Kono region. Additionally, with the help of UNICEF, he is starting a league, where the existing top league has been suspended due to a lack of funds. Bellamy’s Warrior earnings will contribute towards his foundation. Also, keep an eye on Bellamy in the Olympics where he will be sporting a specially designed pair of Warrior boots. The new (all red) kit draws inspiration from Liverpool’s 1964/65 strip that was worn under legendary manager Bill Shankly, who believed the red gave players a physical and psychological edge over their opponents. Warrior has re-introduced the iconic amber yellow Liver Bird emblem, which is reminiscent of the strip worn during Liverpool’s golden era (1976-1985). 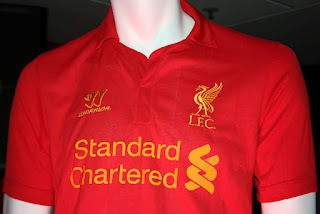 The crest has been fully embroidered on to the shirt - for only the second time in the club’s history. 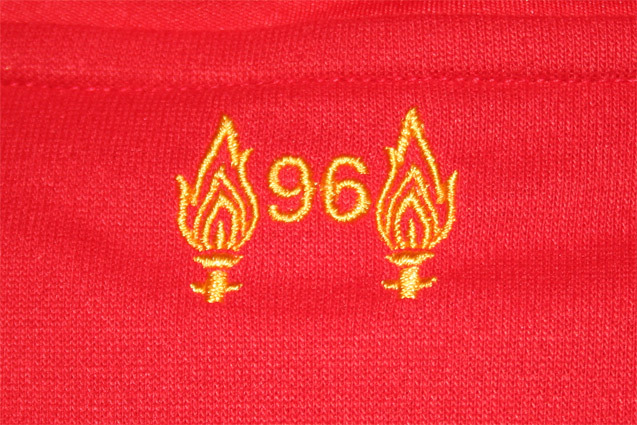 The "96" on the back of the neck, bordered by the Hillsborough flames, remembers the 96 people who lost their lives following a tragic incident at a semi-final that Liverpool played in. 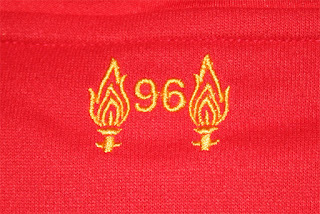 The kit also gives a nod to tragic incidents in Liverpool’s history with the number “96” embroidered on the back of the shirt’s neck, bordered by the Hillsborough flames, commemorating the 96 people who died in a stampede during the FA CUP semi-final tie between Liverpool and Nottingham Forest. The War-Tech fabric utilises Scafé – an antimicrobial fabric that is made with coffee beans, is fast drying and provides UV protection. Additionally, the main body of the shirt is designed with durable water resistant technology, and under-arm four-way stretch mesh that allows for a full range of movement, functionality and air flow to help regulate temperature. Warrior will launch a brand new apparel, footwear and equipment range in December. Natural running footwear brand Newton, distributed in SA by running legend Zola Budd, held barefoot running coaching clinics presented by Newton international’s Ian Adamson throughout the first week of June. 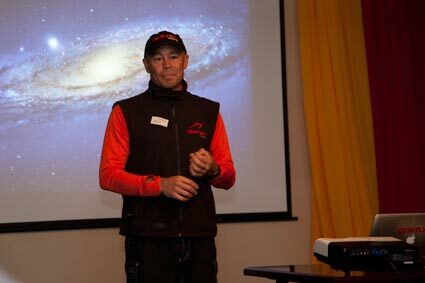 The clinics were held in Durban on the 4th of June at Mabhida Stadium, Johannesburg on the 5th and 6th at St. Benedicts College and on the 7th and 8th in Cape Town at Sahara Park, Newlands. 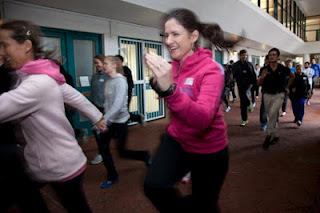 Retailers, biokineticists, podiatrist and other running and footwear specialists were invited to receive barefoot running “training” to advise customers and clients on correct form when running in barefoot or natural shoes. 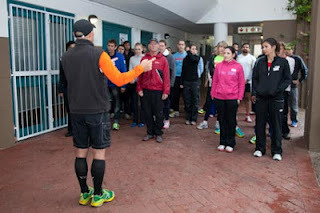 Adamson put attendees through a series of running drills to complement and support barefoot running training. Attendees were videographed whilst running and taught a few tips on good running form before being analysed for a second time around.